We’re not going to pretend we’re so jaded that we don’t love the idea of a voice command alarm clock radio. And unlike a lot of really pointless voice controlled gadgets the idea of yelling at the alarm clock to shut up for a few more minutes sounds satisfying compared to knocking everything of the nightstand trying to find the snooze button. 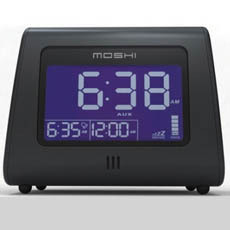 Cool futuristic voice command features aside, the Moshi Voice Control Digital Clock Radio has some high quality speakers to get you pumped up and ready for the day.